This was an innocuous looking spot alright, but the food turned out to be not too bad. 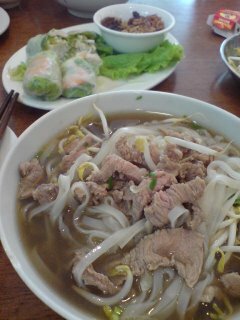 The pho bo, the rice noodle soup, was flavoursome and the slices of beef very tender and fresh. The fresh rice rolls were nicely packed and complimented with a rich peanut dipping sauce. Ii live just a couple of minutes upt he street from here - go there really regularly. Food is very nice, but is very Singaporised - no complaints from me. But I spent 6 years in Vietnam and this isn't quite like what you can get there. Went there yesterday after I chanced your blog - the food was terrible - the fried spring roll was soaked in oil with a strong meat smell ; the fish cake soup was watered down and tasteless. The pork rice was passable, but not worth the price. You guys should revisit this place again if you think the food is ok.